There's a very special feeling when an audience rises as one to give a standing ovation. One knows one has been a part of a very special evening--in this case the New York premiere of Alessandro Scarlatti's comic opera Il Trionfo dell'Onore, which was first presented in 1718 in Naples. This was contemporaneous with Handel operas but, unlike them, clocks in at just over two hours--and two delightful hours they were. 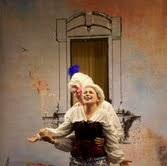 The story concerns a libertine named Riccardo (sung by male soprano Eric S. Brenner) who escapes the law in Lucca and comes to Pisa with his sidekick Capitano Rodimarte Bombarda (a big-voiced and very funny baritone Stephen Lavonier). Two lovely ladies are pursuing Riccardo--both have been seduced and abandoned. Leonora (sung by mezzo Maria Todaro) and Doralice (sung by soprano Elise Jablow) have voices that blended together impressively in their first act duet. Riccardo is trying to get money from his uncle Flaminio (sung by Christopher Preston Thompson) who is betrothed to the local lady Cornelia (the excellent and very funny soprano Briana Sakamoto) but who is lusting after Cornelia's servant Rosina (sung by adorable and spunky mezzo Catherine Leech). Also arriving in Act II is Erminio (sung by the impressive mezzo Stephanie McGuire who successfully negotiated all the changes of register), brother to Leonora and betrothed to Doralice. This poor fellow must defend his family's honor and reconcile himself to his faithless fiancée. Comparisons to Mozart's Don Giovanni can't be helped, but in this case the libertine repents in a splendid aria and everyone gets happily paired off in the end; the final octet is a gorgeous earfull. The direction by Artistic Director Gina Crusco was superb; the action never let up and every gesture felt organic. There was no straining for laughs. Michael Minahan's set was simple but effective--a little table with two chairs on the left and the facade of a house with windows on the right. Nothing more was needed. The costuming by Edgar Cortes was original. During the overture, the eight performers lined up in identical white tunics, printed pants, white pumps and powdered wigs. A woman in contemporary casual attire billed as a "casting agent" (Kelli Butler) but appearing more as a costumer or props person distributed accessories to suit each character. The captain received epaulets, the servant an apron, Riccardo a codpiece, Cornelia a "dowager's hump", Erminio a breastplate and the ladies roses for their hair. Musical values were superb on all counts. Conducted from the harpsichord by Music Director Dorian Komanoff Bandy, Sinfonia New York comprised a string quartet plus oboe and recorder. Evidently a lot of research was done by Mr. Bandy whose concept involved fidelity to the early 18th c. practice of taking liberties with the continuo and with original ornamentation suited to each voice. He claimed to expect audiences to be shocked or unsettled by these liberties; not so! We were only delighted.